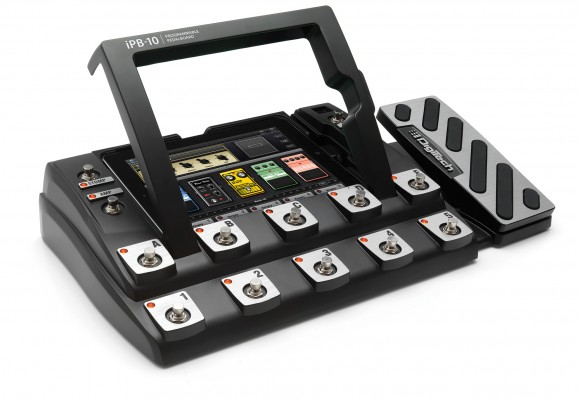 This week the the DigiTech iPB-10 has been revealed, a digital pedalboard which will allow your iPad to play host to several music pedals at once. Inside with your iPad running the official app for this device as its plugged into the device itself, you’ll have access to 87 different pedals, 54 amplifiers, and 26 cabinets, all at a flick of your finger. What more could you want? And don’t say a DJ station, because that’s separate, and we’ve done that before as well — read on for guitar iPad action! This thing sounds awesome if you are a guitar player or a EWI effects addict (raises hand meekly). Except…..$499. Though it sounds like it works without the iPad in it, so, you could have presets all ready and not have to put the iPad in there. This thing also has it’s own DSP chips so the quality of sound and perhaps latency might be better. But still…..maybe $299 would be a better price point? The second piece of gear is the Alesis iO Dock. This thing is $199, and has phantom powered mic inputs, quarter inch outputs, pedal input, headphones. And it works with Garageband, so you can record or whatever you want on it. This sounds amazing and is on my Christmas list this year. XLR inputs means you should be able to hook your sax up and start using effects with this baby. By the way, Garageband is a MUST HAVE iPhone/iPad/iTouch app. It works on all three now. $5. Uniquesquared.com had an excellent review of it using Garageband. 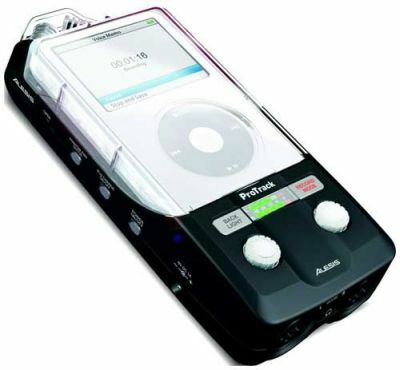 ProTrack provides convenient, direct-to-iPod stereo digital recording to iPod in a portable, handheld form factor. Users can capture live audio anywhere and anytime with their iPod or iPod nano. ProTrack’s smart design integrates the iPod into the recorder, with included sleds to securely mount supported iPod models to the recorder. But only records 16-Bit, 44.1kHz or 22kHz stereo, supplies 48V phantom power to inputs when wall-powered (not on the 4 AA batteries it needs), and it only records to iPod (Classic or 5th Generation), or iPod nano (2nd or 3rd Generation). The last one is the kicker. With Apple due to refresh the whole iPod line anytime, it is rumored that the Classic iPod will be dropped…..and who knows about the Nano. If this product was released like…….two years ago, it would have been great.